August is usually a quiet time in the vineyard as we patiently wait for the grapes to ripen. We expect to start harvesting within the next couple of weeks and tomorrow we will test the maturity of the Syrah for the first time to give us a better idea of where we are and how long there is to go. This involves collecting a sample of individual grapes, about 200, from across the plot; juicing them and then looking at the juice through a refractometer which tells you the sugar content. We will report back tomorrow with more news on this. In the meantime here is a rather shaky photo of last night’s full moon. 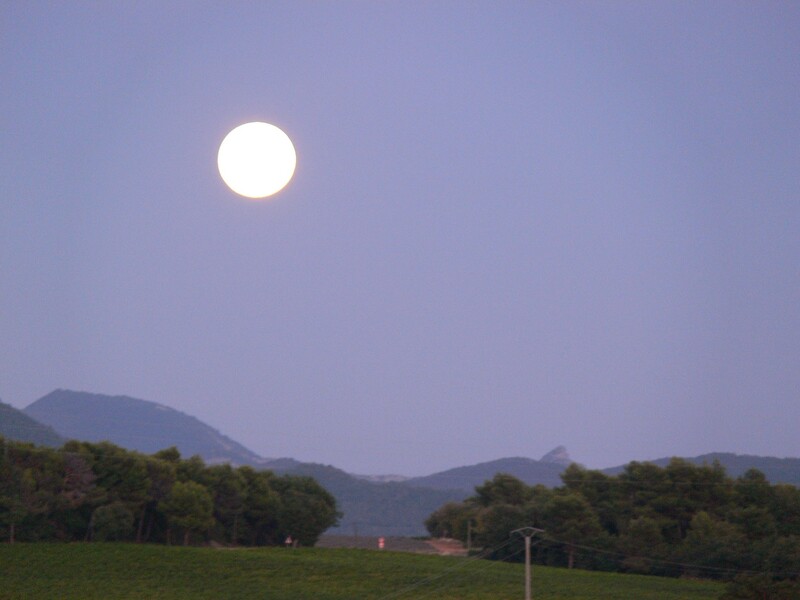 The next full moon on 28 September will be the Harvest Moon (the full moon closest to the Autumnal Equinox) and we certainly expect that we will be fully in to harvest by then.